SAN DIEGO, CA--(Marketwire - Sep 6, 2012) - With a location close to the Gaslamp Quarter, the San Diego Marriott Marquis & Marina makes it easy to access an array of restaurants in downtown San Diego. But with the hotel's latest addition, Marina Kitchen Restaurant & Bar, your appetite for food and decor will find satisfaction just steps from your room. The new downtown San Diego restaurant, run by chef Aaron Schwartz, features modern American comfort cuisine in a space that's much the same -- innovative, stylish decor and a casual atmosphere that will put both corporate travelers and beach-goers at ease. Come here to relax, socialize and take in the vibrant energy and panoramic coastline views. All-day dining at this downtown San Diego hotel starts with a bountiful breakfast buffet featuring seasonal and fresh items, gluten free options, and local Baja favorites. The interactive experience, highlighting the talents of a team of chefs, mixes classic breakfast favorites with modern comfort food options. Lunch is a celebration of food and flavors, with an extensive menu of classics, like Black Bean Chili, Roasted Chicken Salad, and French Dip sandwiches, and the chef's Specialties, including handmade La Quercia Prosciutto and Pesto pizzas, Fried Mexican Rockfish with Chipotle Lime dipping sauce, and Grilled Jidori Chicken Paillard. The restaurant's dinner menu will delight your palate with savory appetizers, sweet desserts, entrees cooked to perfection, and a daily "Roast," including favorites like Basil Garlic Marinated Leg of Lamb, Berkshire Pork Loin, and Herb Roasted Beef Prime Rib, among others. Peruse the entire Marina Kitchen menu here: http://www.marriott.com/hotelwebsites/us/s/sandt/SANDT_PDF/Marina%20Kitchen%20Menus.pdf. Marina Kitchen also offers a diverse wine program with 25 wines by the glass, 250 wines by the bottle and a revolving list of four "barrel sample" wines on tap. The wine program has a strong bias towards California wines, but also offers a global selection of wines in the moderate price range. In addition to wines, Marina Kitchen's beverage menu showcases many of San Diego's top local craft beers and a progressive mixology program that puts a new spin on classic cocktail favorites. Each cocktail is handcrafted to perfection using artisan American Spirits and fresh-squeezed juices. If you're looking for a special dining experience, this new restaurant on San Diego Bay features two private dining rooms with space for up to 12 guests each. Host an important board meeting using the latest technology, or celebrate a happy occasion with close friends and family. The first of two rooms is enveloped in natural woods and stone, while the second opens up to breathtaking Bay views and blends seamlessly with the outdoor terrace. The Marina Cellar, a state-of-the-art wine room housing 2,300 bottles of wine, also doubles as an event space perfect for the wine aficionado. The sophisticated space accommodates up to 20 guests in a casual, reception-style format or may be used for private dining experiences with seating for ten. 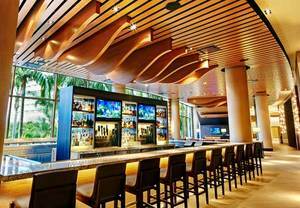 In addition to this latest restaurant, the San Diego Marriott Marquis & Marina offers a number of other options. At Roy's, get that island feeling with Euro-Asian fusion fare served in a waterfront setting. If you're lounging at the pool and don't want to go far for cocktails and fresh, seasonal cuisine, Tequila Bar & Grille is just steps away from the water. Heading out for a day of sightseeing or just need a quick boost? Exchange offers to-go breakfast items, snacks, sandwiches and drinks, while Starbucks can help you get your caffeine fix. If all you want to do is sit back and unwind in front of your TV, in-room dining is also available. To learn more about the dining collection at the San Diego Marriott Marquis & Marina, visit the hotel website at www.marriott.com/hotels/hotel-information/restaurant/sandt-san-diego-marriott-marquis-and-marina/. While the San Diego Marriott Marquis & Marina is a grand presence along the San Diego Bay, with 1,360 guestrooms, you'll still feel like you're in a resort all your own. Whether you're hosting a large meeting or event or just looking for some waterside relaxation, this downtown hotel offers everything you need for a memorable stay. A recent renovation brought changes to the pool, lobby and guestrooms, which feature Marriott's Wired for Business package, luxurious bedding and breathtaking views of the city, bay and Coronado Island. Those wanting an upgraded experience can opt for a concierge-level room with private lounge access and VIP services. Recreation includes a fitness center with yoga classes, two free-form heated outdoor pools, a whirlpool, a bike trail and a 446-slip marina with kayaking, sailing, jet-skiing and more; championship golf is also nearby. If you want to explore the area, this vacation resort is just steps from the Gaslamp Quarter and near top attractions including Balboa Park, LEGOLAND California, San Diego Zoo, Cabrillo Monument National Park and Sea World San Diego. If business brings you here, enjoy easy access to the San Diego Convention Center, right next door, and San Diego International Airport, just 10 minutes away.